First day of winter, otherwise known as the » winter solstice. The word solstice means 'sun stopping,' because the sun appears to cease its southerly trek for a few days around this time each year, before heading back north. The exact time when the sun reaches its southern-most point = 10:47 AM PDT. Interesting how they can pinpoint the exact moment. Today is the longest night of the year (most hours of darkness). Starting tomorrow, the days begin to lengthen. The seasons are caused by a tilt (23-degrees) in the earth's axis .. as we make our annual trip around the sun. Of course, if you live down in the southern hemisphere, everything is reversed. Today is your first day of summer, with the longest day of the year. Summer solstice. Consider this » the earth is 92 million miles from the sun (give or take a few mil). Let's call that distance » the 'radius'. We can calculate the distance of our annual orbit by using the formula for the circumference of a circle » pi x diameter .. which = 3.14 x 184 million, which means we travel » 578 million miles every year (around the sun) ..
.. at a speed of 578-MM / 365 days per year = 1.58 million miles per day, which = .066 million miles/hour, which equals » 66,000 mph (if my math is correct). That's almost 100 times faster than the speed of sound. We're bookin'. Better fasten your seatbelt. Imagine hitting something at that speed. Ouch. The seasons remind us of the cycle of life .. rebirth, renewal .. that no matter how dark things might get, brighter days are coming. And that dark days come to us all. So I'd like to take this opportunity .. of the longest night of the year .. to share a cute experience from last week » I was watching Pooh's Heffalump Movie with the Bug, when he wanted to view all the available DVD options (normally presented at startup). In addition to English, this movie also has options for French & Spanish (spoken, over-dubbed). He wanted to select Spanish, which I had trouble understanding, cuz .. well, he doesn't know Spanish .. beyond a few words we use at a local Mexican restaurant. Myself I know maybe 100 or 200 Spanish words, from interacting with the locals. When I lived in Laguna, we had a Mexican lady come over and clean the house once a week. She taught me most of the Spanish I know. I thought he'd quickly get bored, being unable to understand the movie, but he kept watching, laughing. After a while, the Bug started asking, Does that mean .. thus-n-such? I was startled, cuz it did! He was right. Had he become fluent in Spanish without me knowing? I wondered. Maybe his mom taught him?? I later deduced he must've learned the dialogue (of Trigger & Roo & Pooh & Rabbit), and was able to recall the English phrases when the corresponding Spanish was spoken. We've watched that movie before, but not for months. I thought that was neat .. how he knew the whole movie by heart after only a few viewings. (I could never do that.) He'll be starting kindergarten soon. Great movie, by the way .. about how people we consider 'different' from us (e.g. 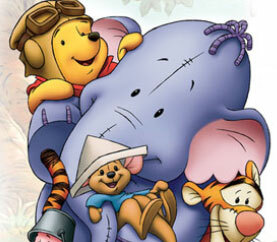 » heffalumps) are not really so different .. once you get to know them. And that's the key (as Pooh will tell you) » getting to know them. Listed below are links to blogs that reference this entry: Winter Solstice = Longest Night (& Heffalumps). This page contains a single entry by Rad published on December 21, 2009 10:47 AM. Newport Harbor Christmas Boat Parade was the previous entry in this blog. A 'Guides' Page & Installing MODx Revolution CMS (beta5) is the next entry in this blog.